The Sinatra Solution: Metabolic Cardiology is written by board-certified cardiologist, Dr. Stephen T. Sinatra. In this book he explains the methods he used with his patients who were on heart transplant waiting lists to bring them back to a normal quality of life. Steven Sinatra discusses the importance of energy metabolism for cardiovascular health and outlines how the use of specific nutritional supplements can have a positive therapeutic effect for the treatment of these conditions. Firstly, Sinatra educates readers about the fundamentals of energy metabolism and how this is involved in the function of the heart. He also elucidates on a number of case histories of his patients who have made dramatic improvements in their health while under his care. He then systematically explains the roles of the nutritional supplements, coenzyme Q10, L carnitine, ribose and magnesium in cellular function and in particular how they affect heart health. All of these nutrients work by improving the supply of energy to the heart muscle, but also have unique and synergistic effects. His explanations are very detailed and are all supported by scientific research. While the information in this cardiac diet is targeted towards the treatment of cardiovascular conditions such as congestive heart failure, arrhythmia and heart attack recovery, Steven Sinatra also goes into the ways these nutrients can improve general health by enhancing the function of the entire body at a cellular level. At the end of the cardiac diet he provides a list of protocols for specific conditions including high blood pressure, age-management, mitral valve prolapse, chronic fatigue syndrome and insulin resistance as well as programs for professional athletes and coach potatoes. This book is focused on the use of specific nutritional supplements for the treatment of heart conditions and does not include dietary recommendations. Stephan Sinatra’s cardiac diet does not include a meal plan. This book does not include exercise recommendations. 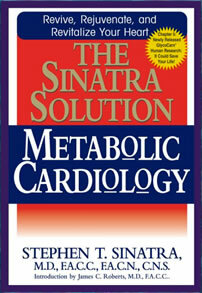 The Sinatra Solution: Metabolic Cardiology retails at $18.95. Click here to purchase this book at a discount. Written by Dr. Steven Sinatra, a cardiologist who has successfully returned patients with serious cardiovascular conditions to good health. Offers an alternative to pharmaceutical drugs and surgery for the management of cardiovascular disease. Can be used as a preventative program for those at risk of developing heart disease. Provides readers with a detailed understanding of the use of the nutritional supplements used in this cardiac diet. This cardiac diet does not contain dietary or exercise recommendations. Many readers may find the detailed scientific information overwhelming. Some patients experience transient dizziness when commencing with ribose supplementation. The recommended nutritional supplements may be expensive. Dr. Steven Sinatra offers patients with cardiovascular disease an alternative to prescription medication and surgery for the management of their condition. The program is based on the use of specific nutritional supplements and has proven to produce very beneficial results, often in patients with the most serious heart diseases such as congestive heart failure. This cardiac diet provides quite detailed scientific explanations regarding how these supplements work to improve the cardiac health. It will appeal to anyone who wants to understand how to optimize heart function, either for the treatment or prevention of heart conditions, as well as for the enhancement of general health.